***Features:1. Material: NON-TOXIC & SAFE, elastic environmentally PU2. Size: 4. in. Peach + 7 in. Ice Cream cone + 4.3 in. Chips + 4in. Bread + 4.3 in. cheeki Lemon charms3. Color: show as pictures, chips red or pink, colorful bun with different cute faces(Random shipment)4. Pattern: super slow rising5. Applicable age: more than 3 years old***Five-in-one package included: 1pc Peach + 1pc ice cream cone + 1pc frech fries + 1pc bun + 1pc cheeki lemon squishies***Notice:1. Can not eat, just a toy! Kids need to play under the adult supervision.2. Bekker's squishies are super slow rising, different from other sellers. If some has dent because of transportation, it will recover after a couple of days(maybe one day).3. If some items have a slight smell from the paint applied, this smell dissipates after a few days. 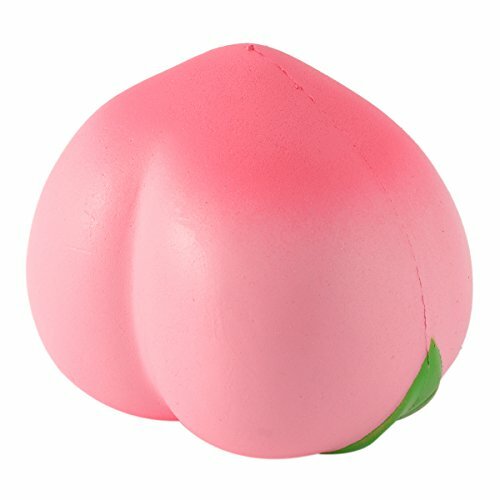 It's NON-TOXIC & SAFE.Decompression squishy toys for a variety of occasions, such as offices, schools, outdoor activities, interior decorations, holidays party supplier etc...When you are unhappy or so depressed, you can squeeze or trample on the kawaii squishies, regard them as soft vent tool to release. Kids and adult will love them so much! Color:A.5 kinds squishies ***Features: 1. Material: NON-TOXIC & SAFE, elastic environmentally PU 2. Size: 4. in. Peach + 7 in. Ice Cream cone + 4.3 in. Chips + 4in. 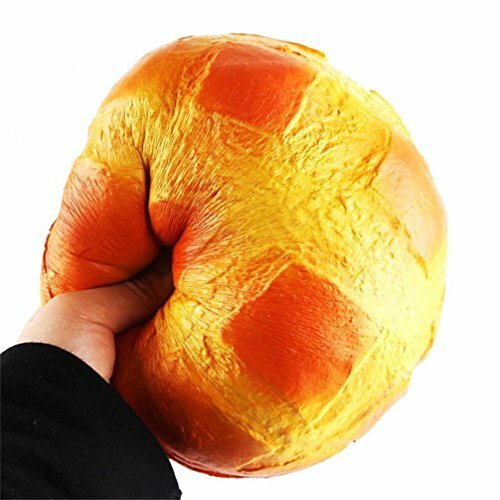 Bread + 4.3 in. cheeki Lemon charms 3. Color: show as pictures, chips red or pink, colorful bun with different cute faces(Random shipment) 4. Pattern: super slow rising 5. Applicable age: more than 3 years old ***Five-in-one package included: 1pc Peach + 1pc ice cream cone + 1pc frech fries + 1pc bun + 1pc cheeki lemon squishies ***Notice: 1. Can not eat, just a toy! Kids need to play under the adult supervision. 2. 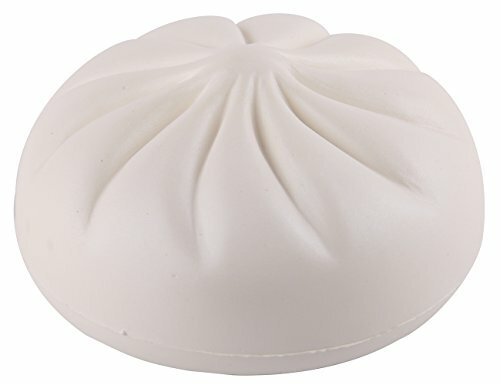 Bekker's squishies are super slow rising, different from other sellers. If some has dent because of transportation, it will recover after a couple of days(maybe one day). 3. If some items have a slight smell from the paint applied, this smell dissipates after a few days. It's NON-TOXIC & SAFE. 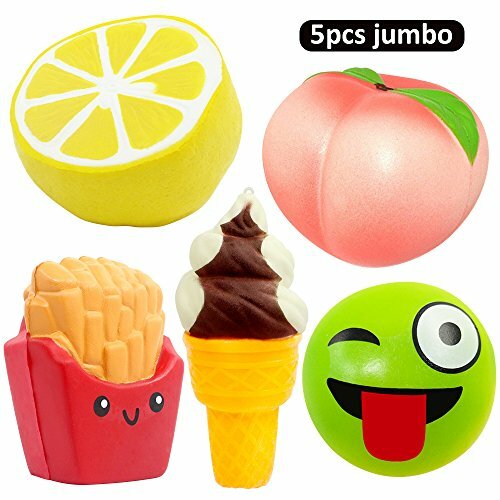 Decompression squishy toys for a variety of occasions, such as offices, schools, outdoor activities, interior decorations, holidays party supplier etc... When you are unhappy or so depressed, you can squeeze or trample on the kawaii squishies, regard them as soft vent tool to release. Kids and adult will love them so much! 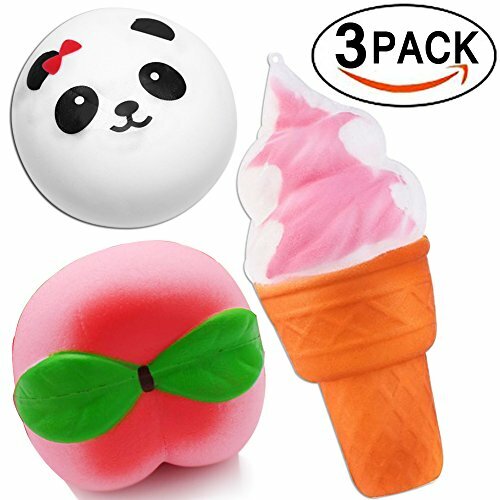 3 Packs Squishies Jumbo Squishy Toys Decorations Party Favors for Kids Adults Birthday GiftsMaterial:Polyurethane foam, non-toxic,safety.Toy sized:1 x 4" Peach1 x 4" Panda bread1 x 6.2" Ice creamFunction:To relieve stress and anxiety.To increase blood circulation of hands, as a rehabilitation exercise.Also can be used for interior decoration, festival items and children party ,Christmas gifts, birthday gifts, children's kitchen food toys.Notice:Due to prolonged storage, sealed bags will have a slight odor, the smell will slowly disappear after opening the bag for 24 hours.Far away from children under 3 years old, play it under adult's supervision, to avoid accidental swallowing (The product is inedible). Features: 1. Material: non-toxic and safe, environmentally elastic PU 2. Size: 3.7 x 3.2 inches 3. Color: STAR COLOR 4. Pattern: super slow rising 5. Applicable age: more than 3 years old Notice: 1. Can not eat, just a toy! Kids need to play under the adult supervision. 2. If some items have a slight smell from the paint applied, this smell dissipates after a few days. Happy Valentine's Day! 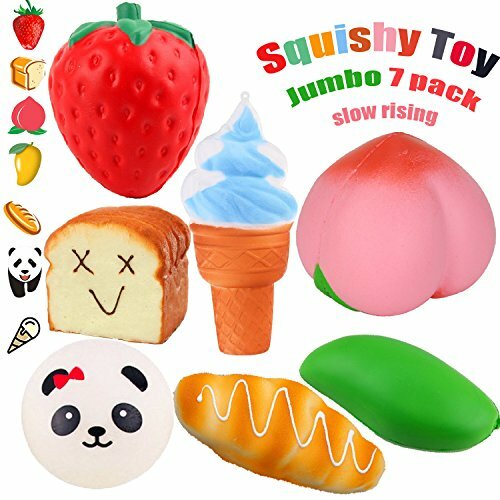 7 Pack of Jumbo Squishy toy! !Peach -4.1 inchesStrawberry -4.3 inchesMango -4 inchesButter Bread -5 inchesPanda Bun -4 inchesEmoji Toast -3.2 inchesIce Cream -7 inchesBe a pack of food play toy for kids - This pack can be Delicious Brunch for you. !! When you wake up in the morning. What you need is not only the sunshine but also the delicious breakfast. Three different breads and the fruits can make you more healthy. And the Dessert of Ice Cream can give you a nice day!! Be a good partner to help you relief your stress - In this fast modern life, maybe you will feel stress and nervous after your whole day work. And this time, you can get this pack !! They're jumbo and Squishy toy, you can do anything for them(but please don't kill them). Vivid and High Quality, you can enjoy yourself.HAVE A NICE DAY!! 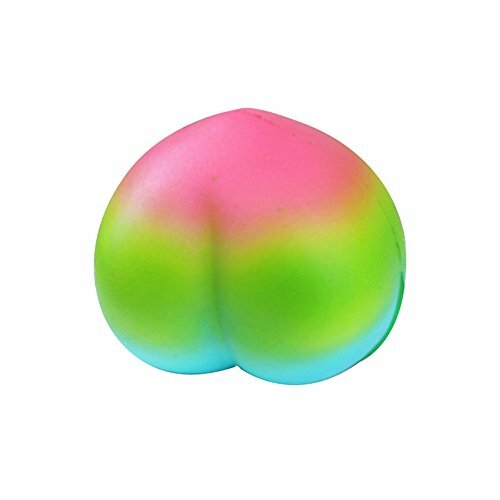 ;) Something you need to know:This pack of squishy toys with fragrance but non-toxic, and the smell is generally reduced in two days. Carefully purchased if you mind. 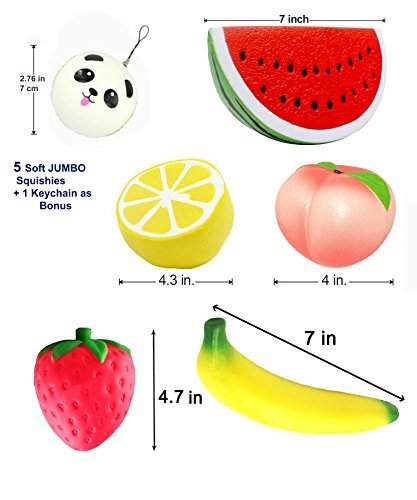 Squishy 5pcs Jumbo squishies+ 1 Bonus Panda Bun Keychain. Peach, Lemon, Watermelon, Strawberry, Banana. 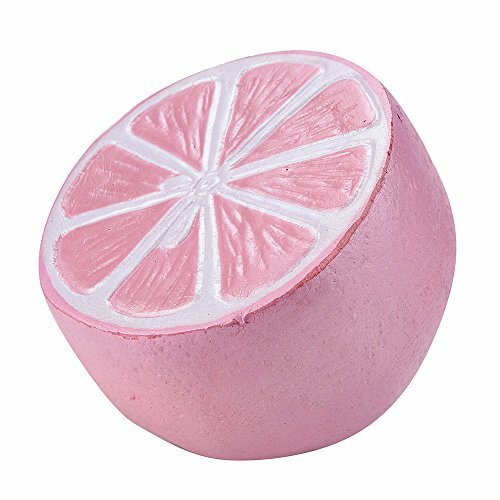 Slow Rising Squeeze Scented Charms Hand Wrist Toys. Copyright © Wholesalion.com 2019 - The Best Prices On Peach Buns Online.